Description of fields used when entering or importing archival descriptions using MODS in a CSV file or entering the data manually. At present, there is no MODS-based CSV template for importing descriptions into AtoM. However, because MODS is based on the International Council on Archives ‘ ISAD(G) standard (see: ISAD), the ISAD CSV template can be used for import, as all templates have been crosswalked in AtoM where possible. To test this, we recommend creating a full MODS description in AtoM, and then changing the display template to ISAD, to determine where field in MODS map to ISAD. For more information on changing the display template for a description, see: Change the display standard. If desired, all templates in AtoM can be changed at the same time using the Default template setting available in Admin > Settings - see Default templates. The CSV mappings below will provide guidance on which ISAD CSV fields can be used to import your MODS-based descriptions into AtoM. To download the ISAD(G) CSV template for AtoM, please visit our wiki page. Currently AtoM supports the Digital Library Federation second level of adoption for MODS version 3.3 (see DLF Aquifer MODS Guidelines Levels of Adoption). The data entry fields for the MODS archival description edit template. MODS Rule Contains a unique standard number or code that distinctively identifies a resource. MODS Rule A word, phrase, character, or group of characters, normally appearing in a resource, that names it or the work contained in it. Choice and format of titles should be governed by a content standard such as the Anglo-American Cataloguing Rules, 2nd edition (AACR2), Cataloguing Cultural Objects (CCO), or Describing Archives: A Content Standard (DACS). Details such as capitalization, choosing among the forms of titles presented on an item, and use of abbreviations should be determined based on the rules in a content standard. One standard should be chosen and used consistently for all records in a set. MODS Rule Use the actor name field to link an authority record to this description. Search for an existing name in the authority records by typing the first few characters of the name. Alternatively, type a new name to create and link to a new authority record. MODS Rule Select the type of activity that established the relation between the authority record and the resource. MODS Rule Enter free-text information, including qualifiers or typographical symbols to express uncertainty, to change the way the date displays. If this field is not used, the default will be the start and end years only. MODS Rule Enter the start year. Do not use any qualifiers or typographical symbols to express uncertainty. Acceptable date formats: YYYYMMDD, YYYY-MM-DD, YYYY-MM, YYYY. MODS Rule Enter the end year. Do not use any qualifiers or typographical symbols to express uncertainty. Acceptable date formats: YYYYMMDD, YYYY-MM-DD, YYYY-MM, YYYY. MODS Rule A term that specifies the characteristics and general type of content of the resource. Assign as many types as are applicable. The Type of resource options are limited to the values in the MODS typeOfResource top-level element. These two fields can be used to add lower levels to a collection level description. Click “Add new” to create as many child levels as necessary. Identifier: The unambiguous reference code used to uniquely identify the child-level resource. Title: The name given to the child-level resource. MODS Rule A designation of the language in which the content of the resource is expressed. Select as many languages as required. MODS Rule A term or phrase representing the primary topic(s) on which a work is focused. Search for an existing term in the Subjects taxonomy by typing the first few characters of the term name. Alternatively, type a new name to create and link to a new subject term. MODS Rule Search for an existing term in the Places taxonomy by typing the first few characters of the term name. Alternatively, type a new term to create and link to a new place term. MODS Rule “Choose provenance, author, and other non-subject access points from the archival description, as appropriate. All access points must be apparent from the archival description to which they relate.” (RAD 21.0B) The values in this field are drawn from the Authorized form of name field in authority records. Search for an existing name by typing the first few characters of the name. Alternatively, type a new name to create and link to a new authority record. MODS Rule Information about restrictions imposed on access to a resource. See MODS accessCondition top-level element for more information on how to use this field. MODS Rule Identifies the institution or repository holding the resource. 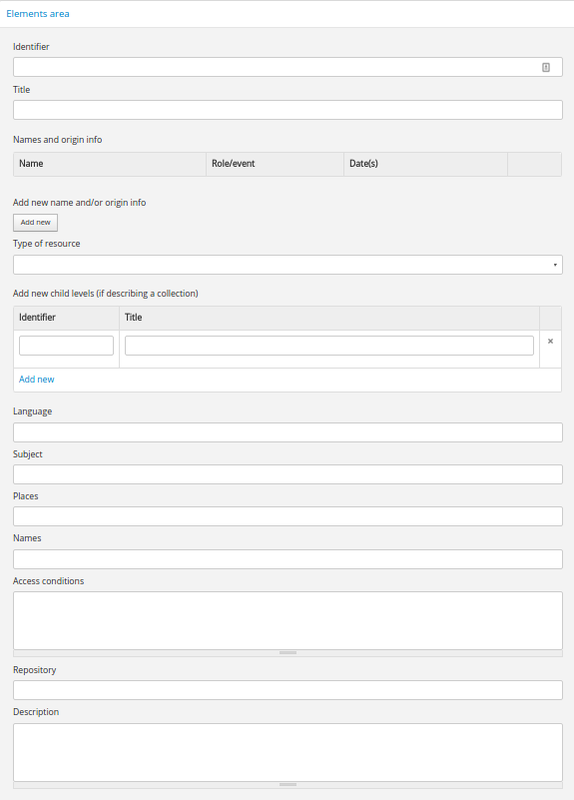 Search for an existing repository name by typing in the first few letters of the name. Alternatively, type a new name to create and link to a new repository record. MODS Rule An abstract, table of contents, or description of the resource’s scope and contents.